The filled loaf pan just before going into the oven. Be sure to place it on a baking sheet or you’ll have burned cheese on the floor of your oven. After dropping carbohydrates from my diet (except for beer, which I have to drink for work), I also dropped a bunch of weight, going from a size 36 trouser waist to a 30. I occasionally miss the idea of a deep-dish pizza or a sub sandwich or even a slice of buttered toast with morning coffee, but I can easily live without that stuff. 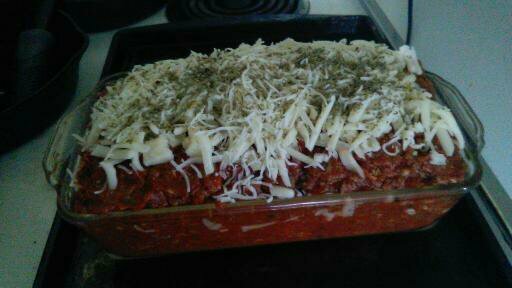 However, the thought of lasagna often entered my brain, to the point where I was ready to make a giant pan of lasagna. I could not come up with an idea for replacing the all-important lasagna noodles. It’s easy to come up with noodles for spaghetti – spiralize a zucchini for zoodles. Could I use a mandoline to cut planks of zucchini in place of lasagna noodles? Maybe, but how to get rid of the extra liquid the zucchini will undoubtedly provide? I found some zucchini lasagna recipes and another that used cabbage in place of noodles, and one that substitutes eggplant. A piece of the pillowy cheese noodle lasagna being reheated. And then I found Just Like the Real Thing Low Carb Keto Lasagna on a website called peaceloveandlowcarb.com. 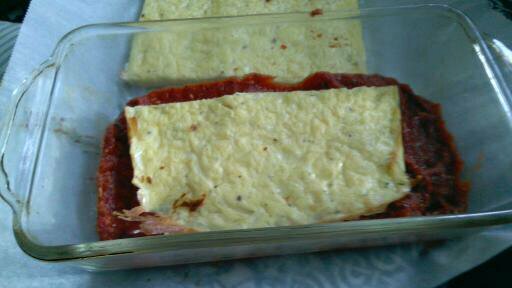 A combination of baked cheeses and eggs replace the wheat noodles. After reading the recipe several times, I convinced myself that it was both doable and potentially delicious. The directions call for mixing eggs, cream cheese, Parmesan, mozzarella, Italian seasoning, garlic and onion powder, pouring that slurry into a 9”x13” parchment-covered pan, baking, cooling and then cutting into three noodles. How, I wondered, does it work with three noodles? Do I have to make a bunch of these cheesy slabs? Going back to the recipe, I learned I had previously glossed over that this is a bread loaf pan lasagna, which suddenly made perfect sense. The three cheese “noodles” were the perfect size for a loaf pan. The result was a pillowy, deliciously cheesy lasagna that deeply satisfied my lasagna craving. I will be making this again, probably sooner rather than later. 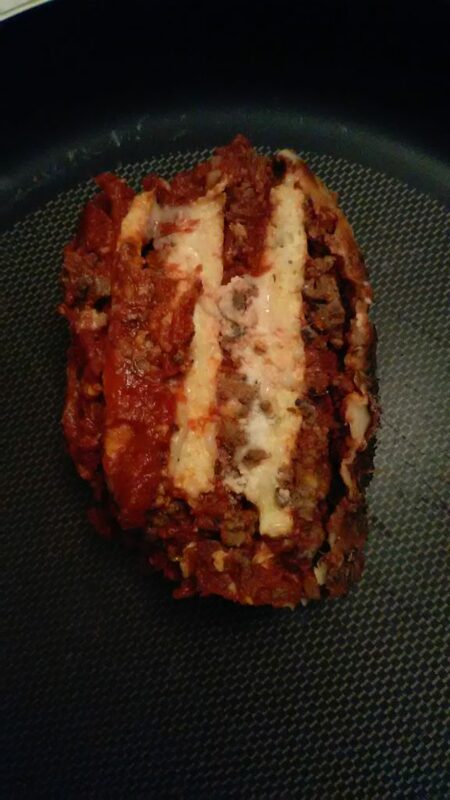 Here, courtesy of peaceloveandlowcarb.com, is Just Like the Real Thing Lasagna. 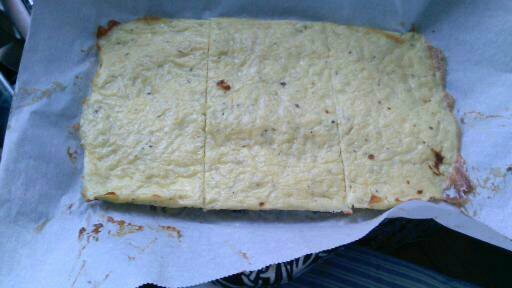 Here the cheese “noodle” has cooled and I’ve just sliced it into three equal sections. Preheat oven to 375°. Line a 9”x13” baking dish with parchment paper. In a large mixing bowl, using a hand mixer, cream together cream cheese and eggs. Add Parmesan cheese, Italian seasoning, garlic powder, and onion powder. Mix until all ingredients are well combined. Using a rubber spatula, fold in mozzarella cheese and mix until well incorporated. When the “noodles” are done baking, cool in the fridge for about 20 minutes and then cut into thirds. This makes three perfectly sized “noodle” layers for a loaf pan. The first layer of cheese sits on top of a scoop of the marinara.